At the Region is an ongoing feature that discusses the state-by-state training, certification and employment requirements of first responder departments across the nation. 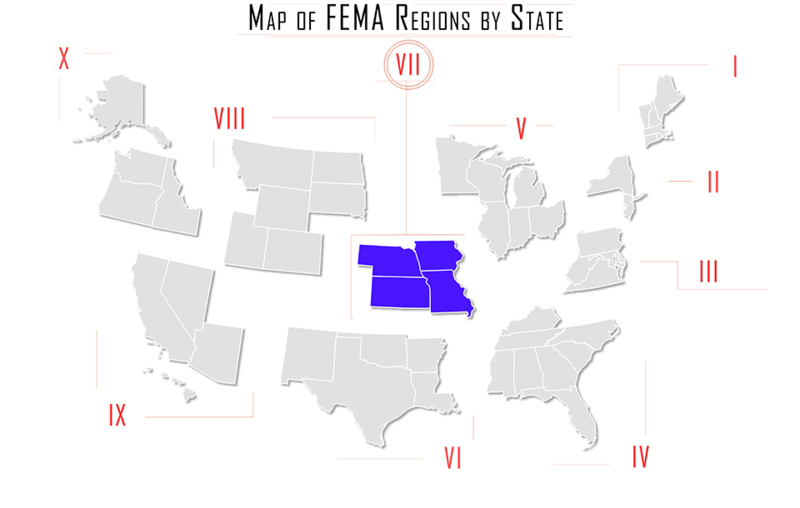 In this issue, At the Region looks at EMS requirements in FEMA Region VII: Iowa, Kansas, Missouri, and Nebraska. Emergency Medical Technician certification levels result from a combination of national requirements and state-by-state regulations. All EMT training must meet minimum standards provided by the National Highway Traffic Safety Administration (NHTSA); this includes fundamentals in areas such as anatomy, medicine, and trauma, but states determine the final designations and requirements. An independent organization, the National Registry of Emergency Medical Technicians, also provides guidelines, and, although these are not mandatory, NREMT exams are used as the basis for certification at one or more levels in 45 states. Because of the variation in training, the NREMT national certification as an EMT does not equate to a license to practice, and transferring local certification depends on state-by-state reciprocity agreements. In order to obtain certification, applicants must complete an approved course through one of the training sites in the state; all programs must meet 2005 National Education Standards for acceptance. Following the course, students must pass an examination provided for their level of application to complete the certification process. EMT certification is valid for two years, after which EMTs must renew their certification. Renewal requirements may be met by completing 24 hours of continuing education (CE) for EMTs, 36 hours for AEMTs, or 48 hours for paramedics, or by registering with NREMT prior to the certification’s expiration date. The application for recertification must be made at least 90 days prior to expiration. Additional training or testing may be required to complete certification; contact the Iowa Department of Public Health for more information at 515-281-0620. If training is necessary, applicants will receive an EMS Endorsement Preliminary Approval Form, which can allow applicants to function as an EMS provider for employment purposes, or provide entrance to an Iowa training program. EMT certification in Kansas is provided by a partnership of the Kansas Board of Emergency Medical Services (KBEMS) with the Information Network of Kansas. Applicants must complete an educational program that meets USDOT National Standards, and either register with NREMT or complete a state written and practical application. Certification renewal is required every two years, and can be completed through the Kansas State Renewal page once applicants have completed the required continuing education hours. A breakdown of the requirements by level is provided here. Reciprocity is offered to EMTs who are NREMT registered and have completed training that meets the USDOT National Standard Curriculum, or NREMT Standards at the level of certification requested. Training will be reviewed and must be found to contain at least 90 percent of the content in the Kansas Emergency Medical Services Education Standards; missing training outside of these guidelines must be obtained from a Kansas-certified EMS Instructor-Coordinator or training officer prior to certification. Applicants are required to submit a two-part application, the second section of which must be completed by the applicant’s instructor or a representative from the educational program attended. • An FBI Fingerprint background investigation – applicants who have resided outside of Missouri within the past five years must submit two “applicant” fingerprint cards along with the application (instructions). When renewing an EMT license, applicants should submit the same form with the additional continuing education section also completed. EMT-Bs must complete 100 hours of CE credit every five years; a breakdown of the required credits is provided here. Applications for license renewal must be completed no more than 120 days and no less than 30 days prior to the date of expiration. To certify with NREMT, applicants must pass cognitive and psychomotor examinations conducted at an authorized test site. In order to be eligible for the testing process, applicants must complete a state-approved EMT course that meets NREMT standards within two years of taking the exam, provide verification from the Program Director that proficiency in EMT skills was demonstrated, possess CPR credentials for healthcare providers, and pass a state psychomotor exam. Applicants will also need to register on the NREMT website and pay a $70 application fee to obtain their Authorization to Test. Reciprocity is offered at EMT-B and Paramedic levels for EMTs who are registered with NREMT. Candidates for reciprocity should complete the application for certification and include all required information, including fingerprint cards for the background check. Completed applications can be mailed along with all required documentation to the Licensure Unit Department of Health & Human Services – Public Health, PO Box 94986, Lincoln, NE 68509. Applicants who have completed a DOT-approved course for their level of certification within the past two years, but who are not yet NREMT registered, may obtain a year-long temporary license to work under the supervision of an EMT licensed at the same or higher level. The application for temporary licensure may be downloaded here; this application must also be signed by the EMT agreeing to the responsibility of acting as a supervisor. Applicants must also submit a copy of their renewal notice and proof of CPR certification at the appropriate level. Reciprocity is offered to EMTs who are NREMT registered and meet all other Nebraska requirements for licensing. In order to apply for reciprocal certification, applicants must submit all materials required for initial certification, plus a Request for Verification of Certification/Licensure from another State/Jurisdiction. The majority of this form is to be completed by the issuing agency, and includes training, examination, and certification history information.